Kevin B. Taylor, 51, of Cross Lanes, passed away suddenly, from a heart attack, April 4, 2019 at Thomas Memorial Hospital. He was preceded in death by his parents, Milton Taylor and Norma Rucker Taylor; brother, Milton Taylor, Jr. 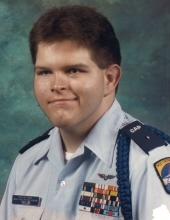 He was a former paramedic for Putnam and Cabell Counties, a CNC Machinist at Terramite Corporation and was a former member of the Civil Air Patrol. Surviving are; his brother, Michael (Sally) Taylor of Ohio; sister, Carol (Wayne) Holstein of Nitro; sister-in-law, Patty Taylor; nieces, Amanda Taylor, and Vickie Holstein; nephews, Milton Taylor, Michael Taylor, Jr., Matthew Taylor and Tommy Holstein. To send flowers or a remembrance gift to the family of Kevin B. Taylor, please visit our Tribute Store. "Email Address" would like to share the life celebration of Kevin B. Taylor. Click on the "link" to go to share a favorite memory or leave a condolence message for the family.